Introduction High tibial osteotomy has been described as an effective procedure for treatment of medial compartmental osteoarthritis of knee. Many techniques have been developed (closing wedge, opening wedge, etc. ), but opening (medial) and closing (lateral) wedge osteotomies are the most commonly used. 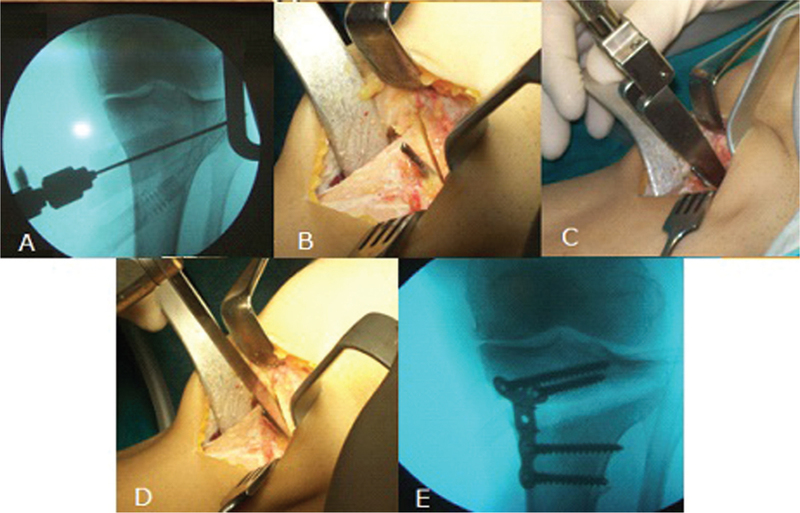 The use of autograft was the gold standard in opening wedge osteotomy for a long time. Patients and methods This is a prospective study carried on 32 knees in 19 patients in a period between January 2011 and January 2013, with a mean follow-up of 17.4±2.87 months. There were 12 males and seven females, with a mean age of 42.5±10.68 years. There were 13 cases with 26 knees with primary osteoarthritis and six were post-traumatic. The preoperative varus angle was measured by the hip–knee–ankle angle on standing scanogram. A single surgical technique was used for knees: medial opening high tibial osteotomy with locked plate fixation but without filling the defect. The preoperative genu varum could not exceed 15°. The following were evaluated: International knee Documentaion committee Scoring (IKDC) functional score and long-leg standing film were performed preoperatively, postoperatively, and at follow-up to evaluate limb alignment and validate the precision of the correction and its stability over time. Results Bone union occurred at 4.3 months on average; two knees required revisions (6.25%). The first was because of delayed union and was revised with an autograft at the seventh month, and another case of nonunion with implant failure was revised at the fourth month by total knee replacement. Before the surgery, the average varus was174±2.18° (165°–176°); after the surgery, the hip–knee–ankle angle was183°±1.88° (179°–184°) (P=0.0001). This correction was maintained at follow-up. Average Knee Score was improved from 68.0±20 preoperatively to 91.0±19 postoperatively. The Visual Analog Scale score was 76±23 and 38±19 at preoperative and postoperative, respectively, with an average reduction of 38 points. Full weight-bearing without assistance was possible after 3 months on an average. Conclusion Union of the arthritic knees was possible without using bone graft (BG). The time to union was comparable to that after using (BG). Meanwhile, It avoids the risks and complications that might be associated with the use BG or Bone substitutes. High tibial osteotomy (HTO) has been described as an effective procedure for treatment of medial compartmental osteoarthritis of the knee, especially in young and active individuals . The goal of the surgery is to reduce or even eliminate pain by unloading the medial compartment . Many techniques have been developed (i.e. closing wedge, opening wedge, dome, and chevron osteotomies), but opening (medial) and closing (lateral) wedge osteotomies are the most commonly used . Medial opening wedge high tibial osteotomy (OW-HTO) was first described in the 1950s , for the surgical treatment of osteoarthritis of the knee with varus deformity. Since then, many studies have been done for evaluation of this method of treatment with satisfactory results ,,,,,,,,,,. Lateral closing wedge osteotomy, popularized by Coventry  in the Anglo-American literature  and by Judet et al. in France was the technique of choice for many surgeons. However, although this technique seems easy to perform, it carries many risks and drawbacks such as the need to perform a fibular osteotomy, injury to the common peroneal nerve, the risk of compartment syndrome, malunion of the proximal tibia, and difficulty in revision to total knee arthroplasty (TKA) later on . The opening wedge medial osteotomy, described in France by Debeyre and Artigou  avoids the majority of these hazards and complications. However, its popularity was limited for a long time by the need to fill the osteotomy site with bone graft harvested from the iliac crest with its associated morbidity . The use of autograft was the gold standard in opening wedge osteotomy for a long time to ensure union and stability and prevent recurrence ,,,. Other methods where a specific osteotomy cut is made do not require the defect to be filled, but the complexity of these procedures makes them less desirable ,. The availability of new internal fixation implants has made the medial opening wedge osteotomy even more reliable, to the point where some have proposed performing this procedure without filling the gap, and a stiff material with locked screws protects the osteotomy . This study was performed to evaluate the short-term clinical and the radiographic results of OW-HTO without using bone graft. This is a prospective study carried on 32 knees in 19 patients in a period between January 2011 and January 2013, with a mean follow-up of 17.4±2.87 months (range: 10–28 months). There were 12 males and seven females, with a mean age of 42.5±10.68 years (range: 28–55 years). There were 13 cases with 26 knees with primary osteoarthritis and six were post-traumatic ([Table 1]). The preoperative varus angle was measured by the hip–knee–ankle (HKA) angle on standing scanogram. Fully informed consent was taken from all patients. The treatment protocol as well as the surgical procedure was approved from the local ethical committee of our institute and followed the international standards. Medial unicompartmental osteoarthritis without patellofemoral involvement. Genu varum with HKA not less than 165° on standing film. Genu varum less than 165°. Age more than 60 years. Limited range of flexion (<90° flexion). We performed single oblique osteotomy to create an opening wedge without filling the defect and fixed by locked titanium plate. The HKA angle was measured on an anteroposterior view of the lower limb (hip, knee, and ankle) with the patient standing and weight-bearing. A line was drawn from the center of the femoral head to the midpoint of the spine of the tibial eminence and another line from this midpoint to the center of the talus surface of the ankle joint. The medial angle between these two lines is the HKA angle (varus<180°) . The osteotomy site was determined by connecting a line between three points first, 3 cm below the medial joint line, the second at 30% lateral to center of tibial plateau surface, and the third, just above the fibular head center. Then, a drawing of the tibia distal to osteotomy was made and superimposed on the radiograph and rotated until ankle center lied on normal mechanical axis . The amount of medial opening was measured ([Figure 1]). Figure 1 Preoperative standing scanogram for measurement of hip–knee–ankle. The procedure was done with a tourniquet and under image control. The surgical technique was performed through medial longitudinal incision; the medial collateral ligament was removed from the posteromedial tibial cortex. Kirschner-wire was inserted as a guide for osteotomy plan. It was placed from the medial tibial metaphysis curvature directed upward and laterally toward the upper tibiofibular joint. Lateral radiograph was taken to locate the osteotomy plane parallel to the joint surface. The osteotomy was performed along a Kirschner-wire guide initially by an oscillating saw, and then with an osteotome, which stopped at ∼5 mm from lateral cortex, under radiographic control. Opening was performed with introduction of another osteotome with larger thickness. Diathermy cable was placed along the line connecting hip and ankle centers under radiographic control to confirm the restoration of the mechanical axis and absence of lateral translation of distal fragment. Osteotomy fixation was performed by the plate which was placed below the medial collateral ligament. The tourniquet was then released and homeostasis was done. No cast was needed, and only bandage was used ([Figure 2]). Figure 2 Surgical technique. (a) A guide pin was placed from the superomedial portion of the tibial tuberosity to the fibular head ∼1 cm below the lateral articular margin of the tibia. (b) Osteotomy was advanced with an osteotome to 5 mm medial to the lateral cortex. (c, d) Opening the osteotomy site. (e) Application of the plate on medial site. The knee was mobilized 1 day after operation. Six weeks of non-weight-bearing and another 6 weeks of partial weight-bearing walking were advised. Assessment was done clinically and radiologically at 6 weeks, 3, 6 months, and later on every 6 months. Clinically, reduction in pain and improvement of joint function postoperatively were compared with the preoperative period. Visual Analog Scale (VAS) : for subjective perception of pain. Knee Scores (modified by Insall et al. ) for functional assessment of joint. Radiological evaluation: immediate postoperative scanogram was done for measurement of postoperative mechanical axis and follow-up plain film anteroposterior and lateral views at 6 weeks, 3, and 6 months for assessment of union at osteotomy site. Another scanogram was done at the end of follow-up to measure any loss of correction. A loss of correction was defined as displacement of the osteotomy before union or if the HKA angle decreased by 3° or more on standing leg radiographs. Clinical union was determined according to the absence of pain and tenderness at the osteotomy site, and the radiographic union was determined if the ossified lines were visible in the middle of the gap. The nonparametric Wilcoxon test was used to compare the average of the subjective pain difference (difference between preoperative and postoperative follow-up as determined by the VAS score) and the joint function (as measured by the Knee Score comparing preoperative function with that at follow-up). The Kruskal–Wallis test was used to study the difference for the subjective pain and Knee Score parameters based on the length of follow-up ([Figure 3]). Figure 3 (a) The preoperative standing anteroposterior (AP) and lateral radiograph with hip–knee–ankle angle 174°. (b) Immediate postoperative AP and lateral view after open-wedge high tibial osteotomy with hip–knee–ankle angle 183°. (c) The AP and lateral radiograph obtained 6 weeks postoperatively, (d) 12 weeks postoperatively, and (e) 3 months postoperatively showed union at osteotomy site and maintenance of corrected angle. We observed three minor complications that did not require any additional procedure: two cases of superficial infection, and one case of deep venous thrombosis. Two (6.25%) knees required a surgical revision. The first because of delayed union, and it was revised by the use of bone graft only without changing the fixation plates. The surgical revision was done at the seventh month after the first intervention, and the patients showed bone union in less than 10 weeks with no more pain. Regarding the second case, the revision was because of nonunion and implant failure. This failure can be attributed to poor bone quality with early weight-bearing. Revision was done 4 months postoperatively and done by total knee replacement owing to inadequate bone stock for osteosynthesis and advancement of arthritic changes ([Figure 4]). 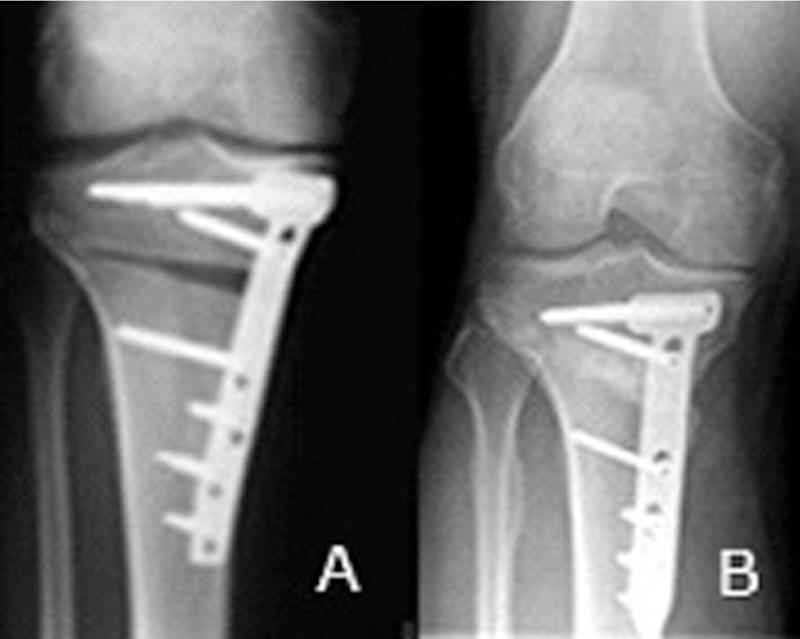 Figure 4 (a, b) Nonunited osteotomy with failure of the implant. (c) Revision with total knee replacement. The VAS was analyzed before surgery (preoperative) and subsequently at the follow-up visit (postoperative). The average value and SD from the average (mean±SD) were then calculated. The average values were 76±23 and 38±19 at preoperatively and postoperatively, respectively, with an average reduction of 38 points. The difference found between preoperatively and postoperatively was statistically significantly (P<0.0001) ([Figure 5]). 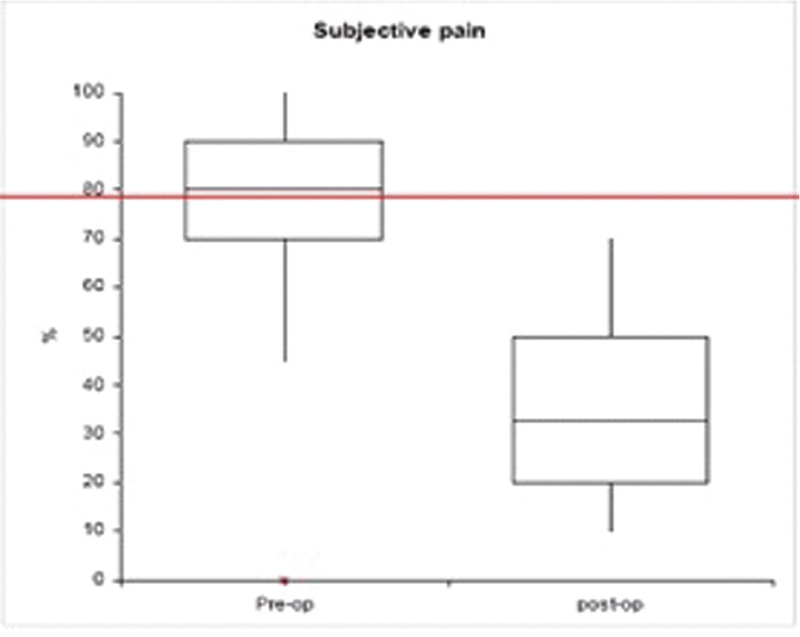 Figure 5 Assessment of subjective pain. The Knee Score was analyzed before surgery (preoperatively) and subsequently at the follow-up visit (postoperatively). The mean value and SD from the mean (mean±SD) were then calculated. Clinical average Knee Score was improved from 68.0±20 preoperatively to 91.0±19 postoperatively. The comparison between average scores showed statistical significant difference (P<0.0001). A slight improvement in the mean values of Knee Scores with increasing follow-up was seen; nonetheless, these values do not show statistically significant differences (P=0.55). Partial weight-bearing was allowed after 6 weeks but full weight-bearing without assistance was possible after 3 months on average. The tibial slope did not significantly change: 5.1±3.27° before the surgery and 5.6±3.87° after the surgery and at the last follow-up. Before the surgery, the average varus was 174±2.18° (165°–176°), and after the surgery, the HKA angle was 183±1.88° (179°–184°) (P=0.0001). This correction was maintained at follow-up. Radiological union occurred on an average after 4.3 months, with a minimum of 2.5 months and a maximum of 5.5. No significant difference was found between the time of union needed and degree of correction ([Figure 6] and [Figure 7]). Figure 6 (a) The preoperative radiograph and (b, c) the follow-up radiographs after 12 months. Figure 7 (a) The immediate postoperative radiograph and (b) the follow-up radiographs after 24 months. HTO in knees with medial unicompartmental degenerative arthritis is an effective procedure for relieving symptoms. It can eliminate pain by transferring the weight-bearing axis from the damaged medial compartment to the lateral side of the joint and delaying the need for a TKA . The average longevity of a HTO has been estimated to be ∼6–7 years, with 20% of patients converted to TKA after 5 years, 40% after 10 years, and 60% after 15 years . Medial OW-HTO represents the gold standard treatment for medial compartment osteoarthritis of the knee in a young person. The alternative is arthroplasty, most notably unicompartmental knee arthroplasty ,,. Regarding factors likely to influence the longevity of the osteotomy, it is advised to do an overcorrection rather than undercorrection . Patients who underwent revision were statistically significantly more likely to have a HKA angle less than 182° than those not revised (P<0.001). There is a great debate about the importance of usage bone graft in the osteotomy site ,. Our study found that an OW-HTO can be performed without grafting and without an elevated risk of nonunion or loss of correction. This study assessed the short-term results of medial opening wedge osteotomy fixed with locked plate without filling the defect. We evaluate the clinical improvement by assessment of subjective pain using VAS score and joint function by IKS. Throughout the literature, pain relief has been uniformly reported as satisfactory. Aglietti et al. followed 61 patients clinically up to 21 years after surgery and reported that 79% had no pain to only mild knee pain . This is comparable with our results for evaluation of pain, and there was an improvement in VAS from 76±23 to 38±19 postoperatively and so for IKS, which improved from 68.0±20 to 91±19. The results of this study are comparable to published data in terms of functional results ,,,. Overcorrection of coronal valgus alignment was important to obtain satisfactory result after HTO ,. Hernigou et al. reported that the best results were obtained in 20 cases of OW-HTO that had mechanical HKA angle of 183°–186°. An anatomical valgus alignment at consolidation between 8° and 15° was significantly correlated with the best result . In the current study, the former recommendation was followed, with postcorrection mechanical hip–knee angle of 183±1.88° (179°–184°) (P=0.0001). To achieve the target alignment, a few points were important, including accurate preoperative planning and careful prevention of lateral tibial translation on opening up the osteotomy. The knee range of motion was not altered significantly after HTO, whereas the function and Knee Scores were significantly improved. Our goal was a correction of 3° valgus to be consistent with published data , and a study of ranges by Thomine et al. . Bone union occurred in an average time of 4.3 months, similar to results reported by Brinkman et al. Bonnevialle et al. who used a tricalcium phosphate macroporous substitute to fill this opening, with the average time of union of 3.7 months . A study done by Koshino et al. found the osteotomy site was united after 4 months using porous hydroxyapatite as a filler (nonresorbable ceramic substitute) after a medial opening wedge osteotomy . Bove  used a porous inert alumina ceramic spacer to achieve union in an average of 3 months; a plate was used for fixation, and there was no loss of correction in the 50 cases. However, a radiolucent margin was observed around this inert, and nonresorbable spacer was found in one-quarter of the cases . Staubli et al. did not use grafts or bone substitutes to fill the gap and reported that full remodeling of the medial cortex can take up to 1 year. They reported one case of nonunion in 92 patients . It can be concluded that bone healing occurs with or without filling of the gap. Furthermore, bone healing times do not vary. It can therefore be debated whether the gap should be filled at all. The results of our technique without using bone graft or introducing an additional foreign body for union and filling of the osteotomy site are comparable with the previous studies. No loss of correction was found between the postoperative evaluation and the follow-up even in the case of delayed union. We allow partial weight-bearing after 6 weeks, while full weight-bearing after 12 weeks. Asik et al. reported that full weight-bearing was possible after 3 months. Staubli et al. using Tomofix for fixation in OW-HTO without filling the gap and without using a brace or cast, found that full weight-bearing was possible at 10 weeks . This study has some limitation: the number of cases is limited, short duration of follow-up but since the initial hypothesis was that the osteotomy site can be united without using the graft and correction can be maintained with plate till union occurred. From thus only short-term follow-up was enough to study these elements and to reach the goal of the study, and finally we did not record any data about body weight and BMI. However, we did not have any cases with marked obesity. Medial OW-HTO is an effective procedure for isolated medial unicompatmental osteoarthritis. Union of the osteotomy without using bone graft occurred in a period comparable to its use without problems. In addition it gets away from the risks related to filling the osteotomy site with bone or an inert substitute. Fan JCH. Open wedge high tibial osteotomy: cause of patellar descent. J Orthop Surg Res 2012; 7:3. Brosseta T, Pasquierb G, Migaud H, Gougeon F. Opening wedge high tibial osteotomy performed without filling the defect but with locking plate fixation (TomoFix) and early weight-bearing: Prospective evaluation of bone union, precision and maintenance of correction in 51 cases. Orthop Traumatol Surg Res 2011; 97:705–711. Amendola A. Unicompartmental osteoarthritis in the active patient: the role of high tibial osteotomy. Arthroscopy 2003; 19:109–116. Jackson JP, Waugh W. Tibial osteotomy for osteoarthritis of the knee. J Bone Joint Surg Br 1961; 43:746–751. Judet R, Dupuis JF, Honnard F. Offsets and arthritis of the knee. The Genu varum of the adult. Therapeutic indications and results. Rev Chir Orthop Reparatrice Appar Mot 1964; 13:1–28. Aglietti P, Buzzi R, Vena LM, Baldini A, Mondaini A. High tibial valgus osteotomy for medial gonarthrosis: a 10 to 21-year study. J Knee Surg 2003; 16:21–26. Akizuki S, Shibakawa A, Takizawa T, Yamazaki I, Horiuchi H. The long-term outcome of high tibial osteotomy. A ten to20-year follow up. J Bone Joint Surg Br 2008; 90:592–596. Coventry MB, Ilstrup DM, Wallrichs SL. Proximal tibial osteotomy: a critical long-term study of eighty-seven cases. J Bone Joint Surg Am 1993; 75:196–201. Flecher X, Parratte S, Aubaniac JM, Argenson JN. A 12-28-year follow-up study of closing wedge high tibial osteotomy. Clin Orthop Relat Res 2006; 452:91–96. Hernigou Ph, Medevielle D, Debeyre J, Goutallier D. Proximal tibial osteotomy for osteoarthritis with varus deformity: a ten to thirteen-year follow-up study. J Bone Joint Surg Am 1987; 69:332–354. Holden DL, James SL, Larson RL, Slocum DB. Proximal tibial osteotomy in patients who are fifty years old or less. J Bone Joint Surg Am 1988; 70:977–982. Jenny JY, Tavan A, Jenny G, Kehr P. Long-term survival rate of valgus tibial osteotomies for gonarthrosis. Rev Chir Orthop Reparatrice Appar Mot 1998; 84:350–357. Koshino T, Yoshida T, Ara Y, Saito I, Saito T. Fifteen to twenty-eight years follow-up results of high tibial valgus osteotomy for osteoarthritic knee. Knee 2004; 11:439–444. Lootvoet L, Massinon A, Rossillon R, Himmer O, Lambert K, Ghosez JP. Upper tibial valgus osteotomy for knee osteoarthritis, aseries of 193 cases reviewed 6 to 10 years post-operatively. Rev Chir Orthop Reparatrice Appar Mot 1993; 79:375–384. Rinonapoli E, Mancini GB, Corvaglia A. Tibial osteotomy for varus gonarthrosis. A 10 to 21-year follow-up study. Clin Orthop 1998; 353:185–193. Coventry MB. Osteotomy of the upper portion of the tibia for degenerative arthritis of the knee. a preliminary report. J Bone Joint Surg Am 1965; 47:984–990. Tunggal JAW, Higgins GA, Waddell JP. Complications of closing wedge high tibial osteotomy. Int Orthop 2010; 34:255–261. Debeyre J, Artigou JM. Remote results of 250 tibial osteotomies for fronyal deviation in varus deformity of the knee. Rev Chir Orthop Reparatrice Appar Mot 1972; 58:335–337. Bonnevialle P, Abid A, Mansat P, Verhaeghe L, Clement D, Mansat M. Tibial valgus osteotomy using a tricalcium phosphate medial wedge: a minimally invasive technique. Rev Chir Orthop Reparatrice Appar Mot 2002; 88:486–492. Goutallier D, Julieron A, Hernigou P. Cement wedge replacing iliac graft in tibial wedge osteotomy. Rev Chir Orthop Reparatrice Appar Mot 1992; 78:138–144. Koshino T, Tomihisa T, Murase T. Medial opening wedge high tibia osteotomy with use of porous hydroxyapatite to treat medial compartment osteoarthritis of the knee. J Bone Joint Surg Am 2003; 85-A:78–85. Levai JP, Bringer O, Descamps S, Boisgard S. Xenograft-related complications after filling valgus open wedge tibial osteotomy defects. Rev Chir Orthop Reparatrice Appar Mot 2003; 89:707–711. Siguier M, Brumpt B, Siguier T, Piriou P, Judet T. Original valgus tibial osteotomy by internal opening and without loss of bone contact. Technique and incidence of consolidation speed: a preliminary series of 33 cases. Rev Chir Orthop Reparatrice Appar Mot 2001; 87:183–188. 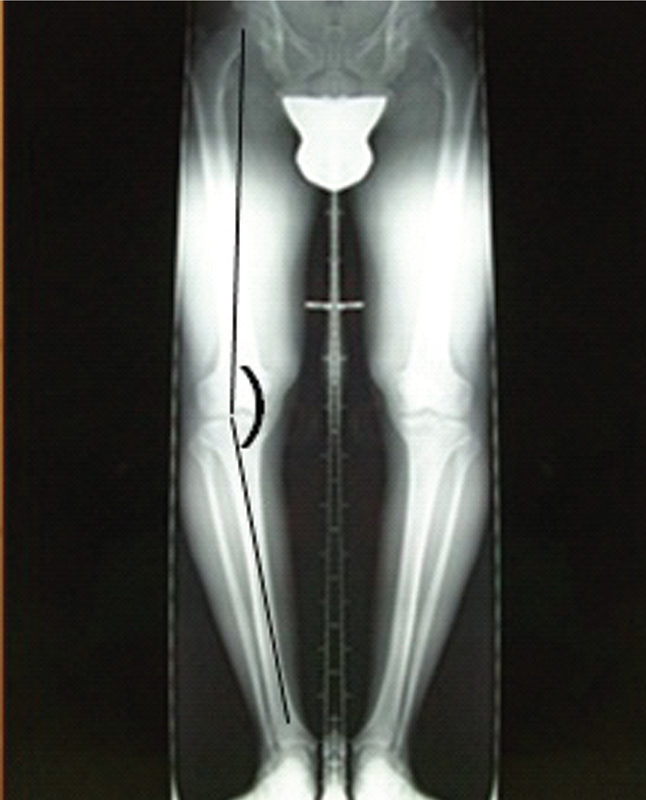 Raymond LD, Laflamme GY, Ranger P. Open-wedge retrotubercular tibial osteotomy: an innovating technique. Rev Chir Orthop Reparatrice Appar Mot 2007; 93:588–593. Staubli AE, de Simoni C, Babst R, Lobenhoffer P. TomoFix: a new LCP-concept for open wedge osteotomy of the medial proximal tibia − early results in 92 cases. Injury 2003; 34:B55–B62. Siu D, Cooke TD, Broekhoven LD, Lam M, Fisher B, Saunders G, Challis TW. A standardized technique for lower limb radiography. Practice, applications, and error analysis. Invest Radiol 1991; 26:71–77. Dugdale TW, Noyes FR, Styer D. Preoperative planning for high tibial osteotomy. The effect of lateral tibiofemoral separation and tibiofemoral length. Clin Orthop Relat Res 1992; 274:248–264. Warden V, Hurley AC, Volicer L. Development and psychometric evaluation of the pain assessment in advanced dementia (PAINAD) scale. J Am Med Dir Assoc 2003; 4:9–15. Insall JN, Dorr LD, Scott RD, Scott N. Rationale of the knee society clinical rating system. Clin Orthop 1989; 248:13–15. Noda T, Yasuda S, Nagano K, Takahara Y, Namba Y, Inoue H. Clinico-radiological study of total knee arthroplasty after high tibial osteotomy. J Orthop Sci 2000; 5:25–36. Kaper BP, Bourne RB, Rorabeck CH, Macdonald SJ. Patellar infera after high tibial osteotomy. J Arthroplasty 2001; 16:168–173. Saragaglia D, Mercier N, Colle PE. Computer-assisted osteotomies for genu varum deformity: which osteotomy for which varus? Int Orthop 2010; 34:185–190. Aglietti P, Rinonapoli E, Stringa G, Taviani A. Tibial osteotomy for the varus osteoarthritic knee. Clin Orthop 1983; 176:239. 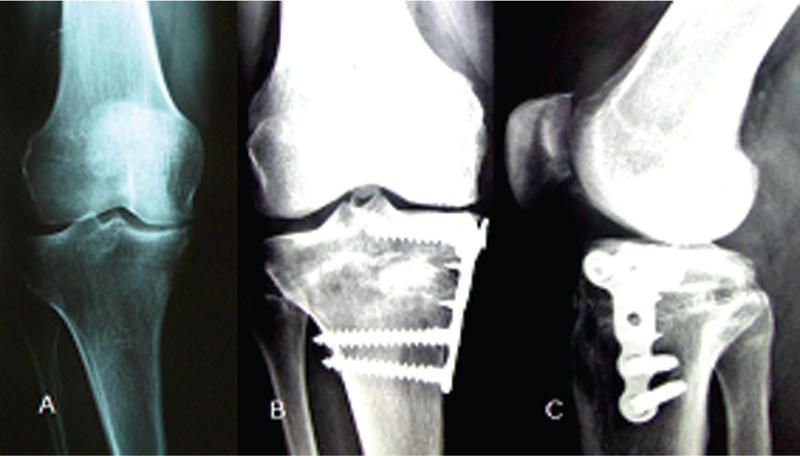 Hernigou P. A 20-year follow-up study of internal gonarthrosis after tibial valgus osteotomy. Single versus repeated osteotomy. Rev Chir Orthop Reparatrice Appar Mot 1996; 82:241–250. Mertl P. Valgus osteotomy by lateral closing wedge. Rev Chir Orthop Reparatrice Appar Mot 2007; 93(Suppl 6):171–172. Takeuchi R, Ishikawa H, Aratake M. Medial opening wedge high tibial osteotomy with early full weight bearing. Arthroscopy 2009; 25:46–53. Brouwer RW, Bierma-Zeinstra SMA, van Raaij TM, Verhaar JAN. Osteotomy for medial compartment arthritis of the knee using a closing wedge or an opening wedge controlled by a Puddu plate: a 1-year randomised, controlled study. J Bone Joint Surg Br 2006; 88:1454–1459. Dubrana F, Lecerf G, Nguyen-Khanh JP. Tibial valgus osteotomy. Rev Chir Orthop Reparatrice Appar Mot. 2008; 94:2–21. Hernigou P, Roussignol X, Flouzat-Lachaniette CH, Filippini P, Guissou I, Poignard A. Opening wedge tibial osteotomy for large varus deformity with Ceraver(TM) resorbable beta tricalcium phosphate wedges. Int Orthop 2010; 34:191–199. Thomine JM, Boudjemaa A, Gibon Y, Biga N. Varizing axial distances in osteoarthrosis of the knee. Rev Chir Orthop Reparatrice Appar Mot 1981; 67:319–327. Brinkman JM, Lobenhoffer P, Agneskirchner JD. Osteotomies around the knee: patient selection, stability of fixation and bone healing in high tibial osteotomies. J Bone Joint Surg Br 2008; 90:1548–1557. Bove JC. Utilization of a porous alumina ceramic spacer in tibial valgus open-wedge osteotomy: 50 cases at 16 months mean follow-up. Rev Chir Orthop Reparatrice Appar Mot 2002; 88:480–485. Asik M, Sen C, Kilic B, Goksan SB, Ciftci F, Taser OF. High tibial osteotomy with Puddu plate for the treatment of varus gonarthrosis. Knee Surg Sports Traumatol Arthrosc 2006; 14:948–954.